The geomagnetic field was quiet to unsettled on March 23. 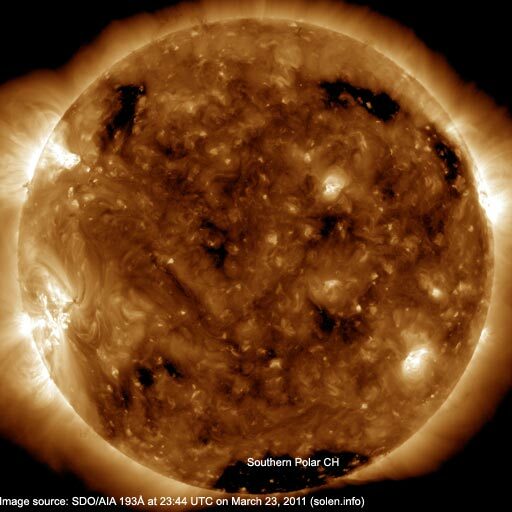 Solar wind speed ranged between 404-483 km/s under the influence of a coronal hole stream from CH441/442. 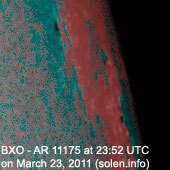 Solar flux measured at 20h UTC on 2.8 GHz was 104.6 (increasing 15.7 over the last solar rotation). The planetary A index was 10 (STAR Ap - based on the mean of three hour interval ap indices: 10.0). 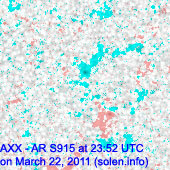 Three hour interval K indices: 32322322 (planetary), 32432322 (Boulder). 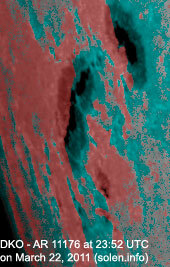 Region 11175 decayed quickly and will rotate out of view at the northwest limb today. 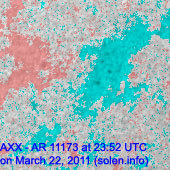 Region 11176 did not display any significant changes. M flares are possible. Flares: M1.4 at 02:17 and C1.1 at 17:10 UTC. 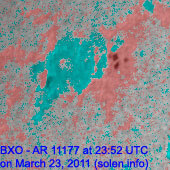 New region 11177 rotated into view at the northeast limb on March 21 and was noticed by NOAA/SWPC two days later. 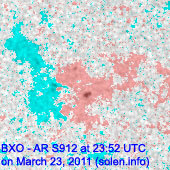 Minor update added at 17:10 UTC on March 24: Region 11176 produced an impulsive M1.0 flare at 12:07 UTC. The region is slowly becoming more complicated. 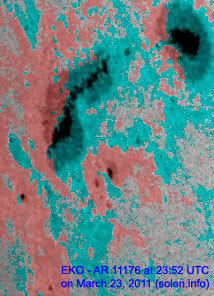 Opposite polarity spots in the southern part of the region are closely separated. 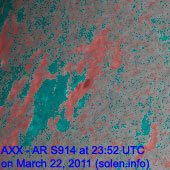 New region S916 emerged near the southeast limb early today (current location: S16E74), new region S917 is rotating into view at the southeast limb (current location: S25E85) and new region S918 is coming into view at the northeast limb (current location: N23E86). 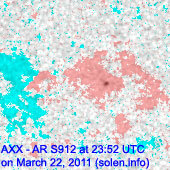 Region S915 has reemerged with a tiny spot while regions S912 and 11177 are both developing slowly. 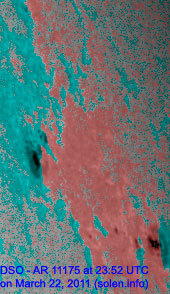 The newest high resolution STAR CHARMAP. 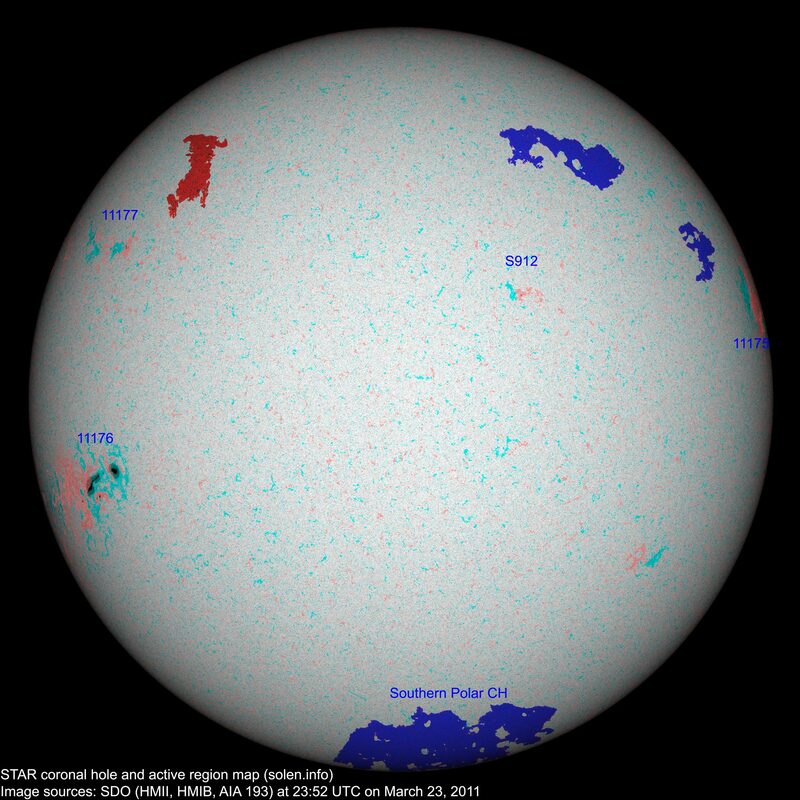 The geomagnetic field is expected to quiet to unsettled on March 24 due to effects from CH441 and CH442. Quiet conditions are likely on March 25-26.